With its black-ash landscape Bodega La Geria, within the 5,225 hectare La Geria national park, is perhaps one of the most striking vineyards in the world, and most unusual due to its harsh environment and volcanic landscape. The last volcanic explosion took place here from 1730 to 1736, leaving the land a permanent shade of black thanks to the amount of ash spewed from the earth. Bodega Le Geria was built in the late nineteenth century by the family Rijo. In 1993 it was acquired by its current owners, the family Melian. 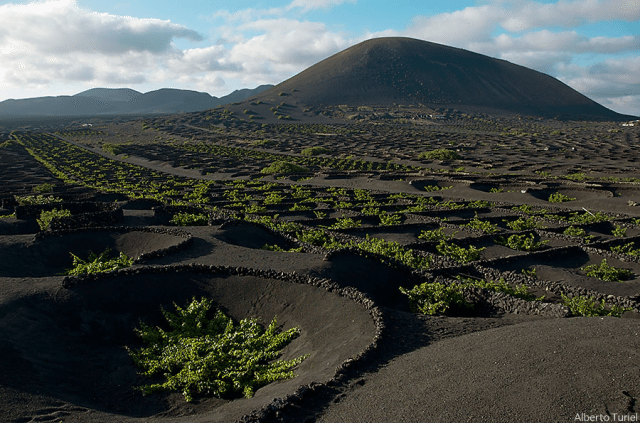 Here, bush vines are planted in individual craters dug out from volcanic soils and ringed by tiny walls (Zocos) to protect the grapes from the island’s from extreme summer winds, which also protect a layer of “picon” (black cinders) that are spread on the surface. Combatting the region’s lack of rainfall, the layer of picon is able to store night time humidity and transfer it to the vine’s roots to water the vine and encourage growth. Malvasia, Merlot, Shyrah, Tintilla are common varieties grown here, with the winery producing a range of dry and sweet wines.